The sweet smoky taste of roasted bell peppers, mixed with half and half to make a rich and creamy sauce. There are many ways to roast bell peppers, but one of the easiest is to place cut halves under the broiler (grill). This is safer and cleaner than using the gas burner on your hob and gives far more sweet smoky flavor than using the oven. This sauce can be made with red, yellow or orange bell peppers. We don’t recommend green bell peppers for this as they do not roast to yield a super sweet flesh. The resulting pepper is a little bitter and doesn’t work in this Roasted Pepper Cream Sauce. 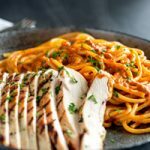 Using skinless and boneless chicken breasts means they cook quickly, but you could serve this with some roasted chicken thighs. 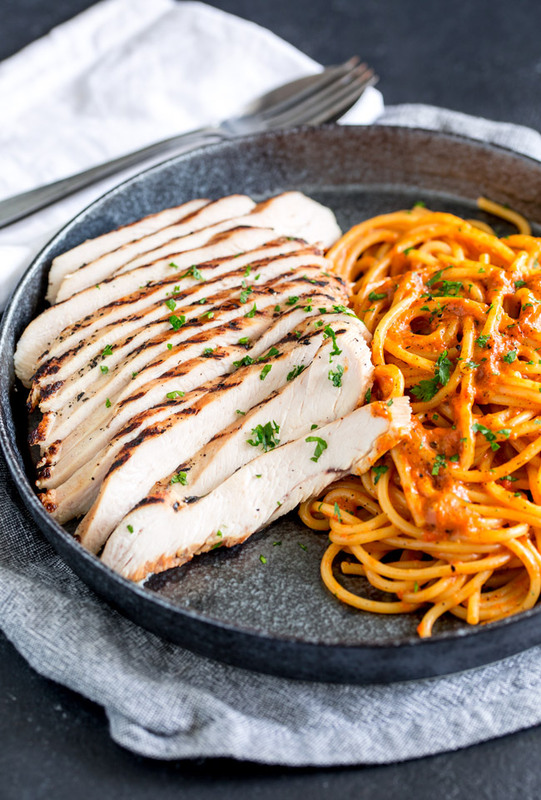 We suggest flattening the chicken breasts before you cook them, this ensures they cook evenly and it also keeps the cooking time low meaning the chicken stays juicy and moist. 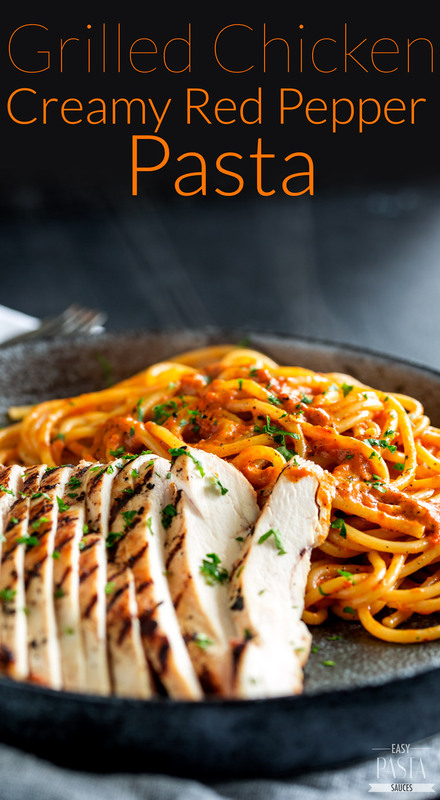 Side: This Grilled Chicken Pasta with Roasted Pepper Cream Sauce dish is packed with rich creamy flavors so a simple side salad of arugula and parmesan works well here. The peppery leaves balance the sweet sauce and the flash of green looks fabulous next to the bright red roasted pepper cream sauce. Wine: This roasted pepper cream sauce is perfect for serving with red or white wine. For those that prefer white wine, add a crisp juicy Vera Vinho Verde or a sparkling prosecco this balances the rich creamy and smoky flavors, in the sauce. For the red lovers a fruity red wine like a Sangiovese will pull out the sweet smoky pepper without overpowering the creamy sauce. 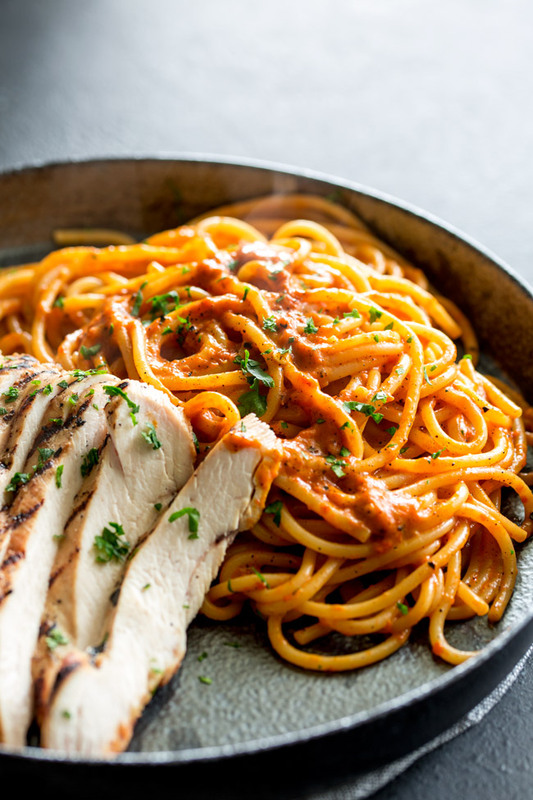 Want to save this Grilled Chicken Pasta with Roasted Pepper Cream Sauce for later? Pin it here. Place the bell peppers cut side down on a baking sheet and then grill under the broiler until the skin is blackened, and the flesh has softened. About 8-10 minutes. Slice the bell peppers into rough pieces. In a skillet, heat up the extra virgin olive oil and then cook the garlic and bell peppers for 2-3 minutes. Place the mixture in blender, cover the lid with a tea towel and then puree. Add in the half and half and puree until you have a thick sauce. 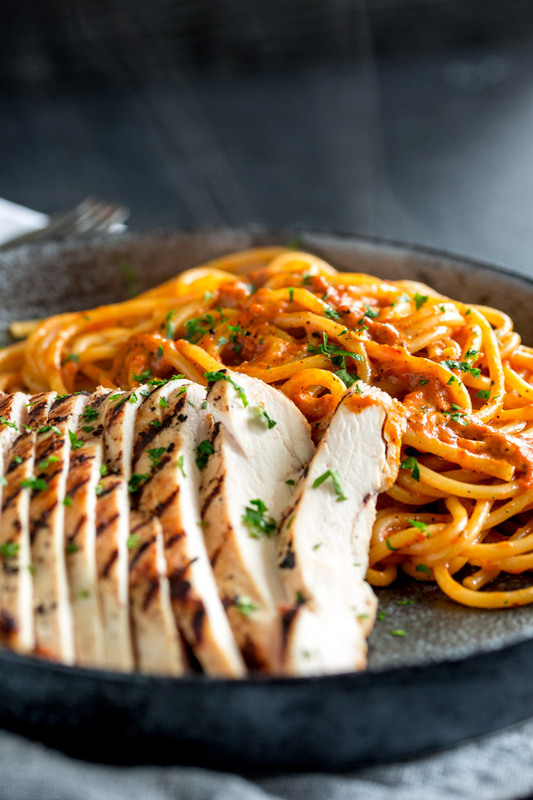 Set aside whilst you make the pasta and chicken. Use the flat side of a meat mallet (or a heavy rolling pin) to flatten the chicken until it is about 1/2" thick. Season the chicken on both sides with salt and pepper . Once it is hot, cook the chicken over a high heat for 2 minutes on one side and then flip and cook for a further 2 minutes or until it is just cooked through. Remove from the heat and tent with foil to keep warm. Whilst the chicken is cooking bring a large pan of water to a boil. Once the water is boiling, salt it generously and add the spaghetti. Cook for 2 minute less than the packet suggests. 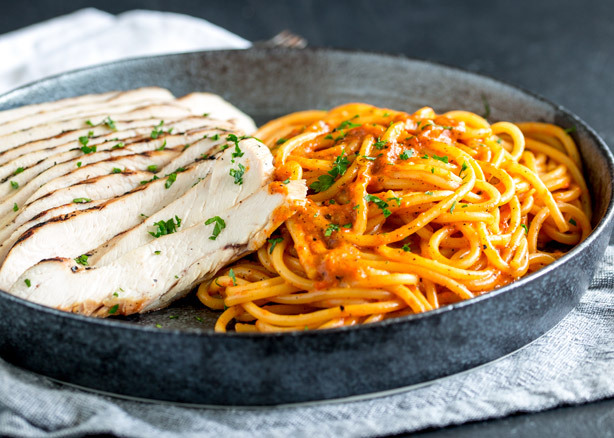 Return the pasta to the pan along with the roasted red pepper sauce and 1/4 cup of the pasta cooking water. Bring to a simmer adding more water if the sauce gets too thick. 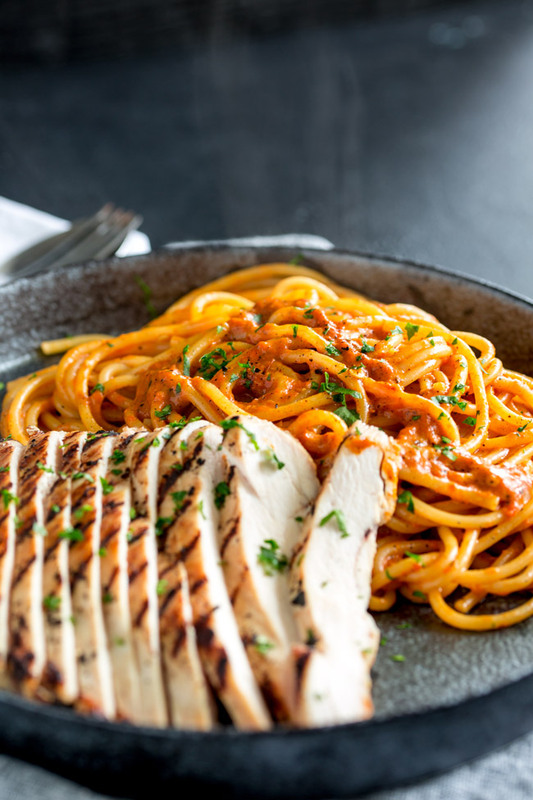 Once the pasta and sauce are hot, serve with the grilled chicken and a garnish of fresh parsley or oregano.